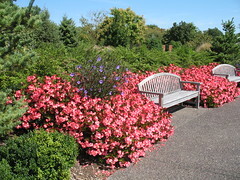 The George Washington Carver Garden – the first of its kind at a botanical garden — opened to the public on Oct. 15, 2005. 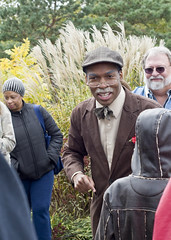 The inspirational garden honors the life and accomplishments of Dr. George Washington Carver, the extraordinary Missouri native scientist who greatly influenced 19th and 20th century agriculture and education. By the end of his life, Carver was an internationally renowned figure, one of America’s greatest scientists, teachers, humanitarians, and advocates for productive, sustainable agriculture. He was the first African-American to study at Iowa Agricultural College and later served on its botany faculty. At the Tuskegee Institute in Alabama, he revolutionized farming in the South by introducing plant diversity, crop rotation, natural fertilizers and conservation methods. Witnessing the destructive effects of centuries of cotton farming on the South’s natural resources, Carver found crops that would restore depleted soils – notably peanuts, sweet potatoes, soybeans and black-eyed peas – and developed hundreds of by-products and uses for them that would increase their market value for Southern farmers. The one-and-a-half acre Carver Garden, built by ICR Construction Services of St. Louis, is designed for peaceful contemplation and learning. It is located on the western edge of the Missouri Botanical Garden, between the Japanese Garden and the Kemper Center for Home Gardening. Entering from the south, visitors proceed down a path lined with inspirational inscriptions from Carver’s writings and speeches, emerging at a central reflecting pool. Benches and a small amphitheater surrounding the water provide a quiet place to relax. The garden is landscaped with fragrant viburnums, hydrangeas and holly trees to give a secluded, intimate feeling. The focal point is a life-size bronze of Carver by acclaimed African-American sculptor Tina Allen of California. 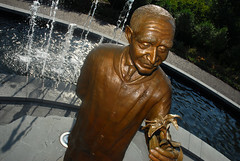 The six-foot statue shows a mature Carver of about 65 years old, wearing a lab jacket and a wise, gentle expression as he stands holding a small plant to the sunlight. Allen’s other works include statues of Sojourner Truth, Alex Haley, Ralph Bunche and Dr. Martin Luther King, Jr.